VMblog: As a Citrix Synergy 2017 sponsor, tell us about your booth and sponsorship this year. 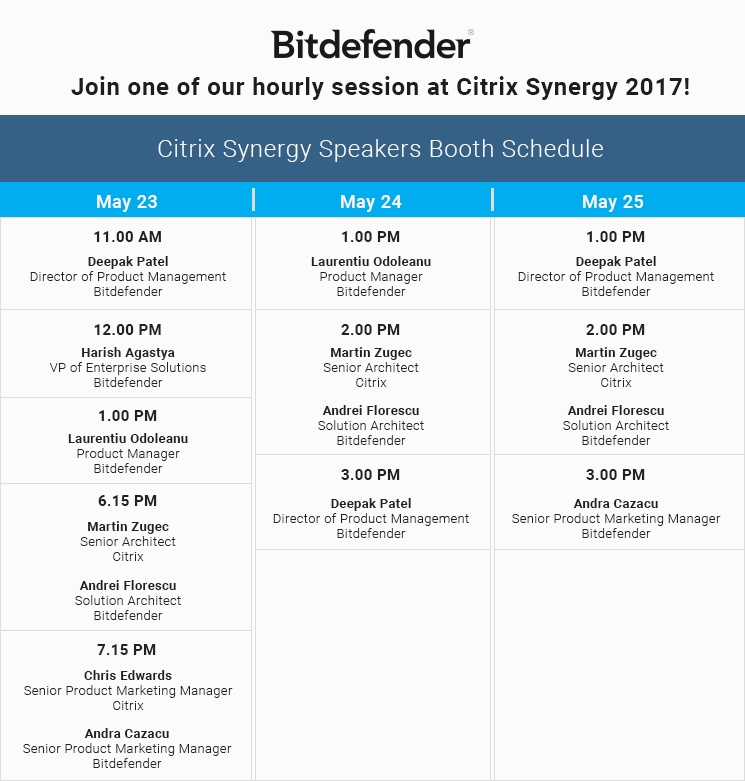 Bitdefender: As a Gold Sponsor at Citrix Synergy 2017, the 20x20 Bitdefender booth (#307) will be home to 15 Bitdefender executives, engineers, and marketing representatives. Bitdefender and Citrix engineers will co-host hourly sessions, focused on targeted attacks in data centers. Bitdefender: This year's booth theme is all about security for data centers against advanced and sophisticated attacks, presenting a technology developed in collaboration with Citrix. The main attraction will be Hypervisor Introspection, which leverages the hypervisor to offer unparalleled visibility and insight into memory-based attack techniques employed by advanced threats. The technology is unique in the security industry, guaranteeing the integrity of in-guest running applications. Our VP of Enterprise Solutions, Harish Agastya, and our Senior VP of Enterprise Sales & Marketing, Vincent Schiavo will also be available for interviews and discussions on how advanced attacks on data centers can be prevented and why Bitdefender's new technology - Hypervisor Introspection - is a game-changer in the industry. Bitdefender: The key message or takeaway after visiting the Bitdefender booth should be that you can now fight back against advanced threats, by leveraging a new layer of security from which no sophisticated attack can hide, while maintaining operational excellence and high consolidation ratios. VMblog: And why should a Synergy attendee add you to their MUST SEE list? Bitdefender: Bitdefender will offer hourly booth sessions, some in collaboration with Citrix - covering the danger of attacks today and how you can stay safe. Each session will be followed by a prize draw for all attendees - a LEGO® Star WarsTM Millennium FalconTM set. At the Bitdefender booth, participants can also witness demos of today's most dangerous attacks and how they can be prevented with the technology showcased by Bitdefender. Booth visitors will also receive exciting giveaways based on their interaction with our booth members. The increased sophistication of today's advanced threats have made companies and organizations susceptible to data breaches that affect a company's reputation and financial stability, and remain undetected for long periods. With current security technologies unable to bridge the gap between security and isolation, Bitdefender Hypervisor Isolation is the only security technology that can detect an advanced attack before it actually compromises your organization's security. Better yet, it works alongside your existing security solutions, with minimum performance impact on your workloads. VMblog: Is this your first Synergy event as a sponsor? If not, what keeps you coming back for more? Bitdefender: This is not the first time Bitdefender has sponsored the Citrix Synergy event. We come back year after year because we are close Citrix partners and, together, we strive to keep virtual infrastructures safe from attacks. Also, Citrix Synergy has a perfect audience to showcase our solutions, consisting of IT professionals and decision makers who understand both the threat landscape and the technical aspects of security technologies. VMblog: What do you like most about sponsoring Citrix Synergy? Bitdefender: The level of engagement in terms of IT professionals is something that we value most at Citrix Synergy. It's a great opportunity for us to present cutting-edge security technologies, and allow security professionals to test them first-hand. We also enjoy partnering with Citrix in activities for event attendees such as Learning Labs and booth presentations. Bitdefender: This year's main attraction at the Bitdefender booth (#307) and the Learning Lab we have prepared in collaboration with Citrix, is a new security technology named Bitdefender Hypervisor Introspection, which we are releasing for General Availability at the event. It's designed to scan raw memory by leveraging Citrix's Direct Inspect API from the hypervisor, to detect and prevent advanced threats that employ memory manipulation techniques to compromise and gain persistency on the targeted victim. Bitdefender: Our solution presents a unique advantage against targeted attacks that endpoint security solutions lack. Scanning at the hypervisor level, with no in-guest agents, gives us a unique edge against attacks such as WannaCry, which Hypervisor Introspection effectively prevented for all its current users. No other security technology can scan raw, unaltered memory from outside the operating system to identify memory manipulation techniques employed by advanced and sophisticated attacks. All current security technologies rely on an in-guest security approach to defend VMs, while Hypervisor Introspection is completely agentless. Bitdefender: Bitdefender Hypervisor Introspection has been designed to work directly with Citrix's Direct Inspect APIs, perfectly integrating Citrix XenServer to secure any and all virtual workloads. It is an ideal solution to protect XenApp and XenDesktop from threats associated with targeted attacks, while maintaining workload performance and easy management. Bitdefender: At this year's event, we're looking forward to showcasing a couple of success stories that we've had with our new Hypervisor Introspection technology, particularly in how it can detect notorious APTs - APT28, Wild Neutron - or the recent WannaCry attack. VMblog: What would you say to prospective attendees who are thinking about attending Synergy but aren't sure if it's worth it or not? Bitdefender: This year, more than ever, we've seen an increase in sophisticated attacks aimed at companies, organizations, and government institutions to exfiltrate information while remaining undetected for as long as possible. It's important to attend this event to understand the increased number of threats that your workloads are exposed to every day and how you can tackle them through XenServer and Bitdefender. Until now, detecting these attacks was painstaking, with Bitdefender Hypervisor Introspection organizations will know the second an attacker tries compromise them, and also have the ability to block them. This technology is the missing link in terms of having a security layer that cannot be tampered with or manipulated with false information from advanced attacks. Bitdefender: Cooperation between security vendors, virtualization providers, and organizations is vital when building a comprehensive security strategy based on technologies designed to offer visibility and protection from advanced attacks, while maintaining operational excellence. Bitdefender: Our main goal at the event is to raise awareness of how advanced and sophisticated attacks work and why, while also providing a unique solution designed specifically to detect and prevent them. It's vital to realize that we now have the technology that can defend data centers and virtual workloads from any form of memory manipulation attack (e.g. zero-days) aimed at corrupting VMs and bypassing in-guest security solutions. Bitdefender: The hypervisor is much more than just a tool for managing workloads, as it can now enforce security and offer unparalleled visibility into the VMs. Bitdefender: Those visiting the Bitdefender booth (#307) that attend the hourly presentations from both Bitdefender and Citrix engineers, can receive various giveaways, such as a LEGO® Star WarsTM Millennium FalconTM set. Attendees who visit sponsor booths and other activities during the conference to gain points through their conference badge, will get the chance to win a Sony VR kit, donated by Bitdefender.